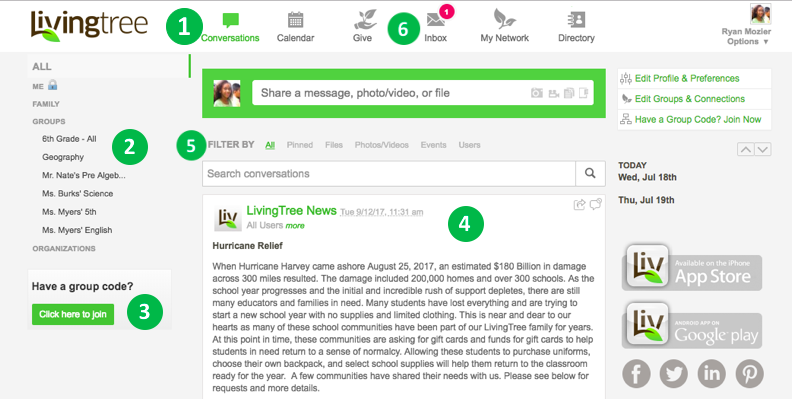 Livingtree	is	your	community’s	own	private	network. As	a	student,	you’ll	receive posts	(messages,	photos,	files) and	events	from	your	teachers	and	school	administrators. You are able	to	join	in	the	conversation	by	sharing	posts,	direct	messages, comments, calendar	events	and	more	with	your	classes. Be	on	the	watch	for	your	Livingtree	login	credentials. You’ll	receive	your	login	from	your	school	or	from	a	“Welcome	to	Livingtree" email. Think	of 'Conversations' as	your	“homepage.” You	can	scroll	through	your	feed to	view the	posts that	have	been	shared	with	you,	or	to	share	a	post	with	any	of	your	classes. You	will	see the	classes	you’re connected	to	in	your	left	navigation	pane. Click	on	a	class	to	filter	your	view/feed	down	to	this	class’	posts	only. If	you have	a	new	code	for	an	additional	class	or	group,	click	here	to	connect using the green 'Click here to join' button. Click the	comment/heart/pushpin	icons	to	comment	on	a post,	like	a post,	or	pin a post	to	your	“pinned”	items. You	can	also	filter	your	feed	on	posts	you’ve	pinned,	photo or	file	posts,	or	by	searching	for	a	particular	contact. Click	on	any	top	application	in	your	top	navigation area ('Calendar,' 'My	Network,' 'Inbox,' 'Directory')	to	take	a	look. Skip	ahead	to	read	a	description	for	each feature. 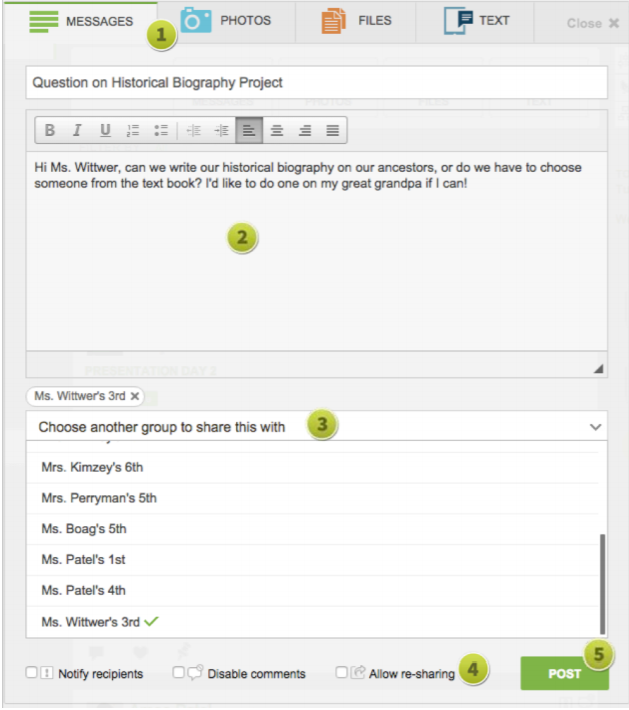 Jumpstart	your	Livingtree	experience	by	sharing	with	your	class(es). Your teacher	and	fellow	students	will	receive	your	post	in	their	Livingtree 'Conversations' feed. Click	on	‘Messages’, ‘Photos’, or	‘Files’	to	begin. If	you	are	posting	photos	or	a	file,	click	on	the	respective	icon. You	can	upload	photos/files	from	your	device. If	you	like,	add	a	subject	line	for	your	post. Type	your	message	in	the	message	field. Utilize	the	formatting	buttons	to	get	creative	with	your	post. Click	the	dropdown menu to	select	whom	you	would	like	to	share	with	– you	can	select	one	or	all	of	your	groups. Check	‘Notify	recipients’	to	send	notifications	for	your	post. Notifications	are	sent	via	email	and	mobile	(through	the	Livingtree	app). You	can	disable	comments	for	your	post	(if	you	do	not	want	others	to	comment),	and	allow	re-sharing	(if	you’d	like	recipients	to	be	able	to	share	your	post	with	their	other	Livingtree	groups). Click	‘Post’	and	you’re	done! Recipients will	see	your	post	in	their	Conversations	stream. One	of	the	easiest	ways	to	use	Livingtree	is	to	download	the	free	mobile	app	for	both	iPhone	and	Android	devices. You	can	post	photos,	create	events,	direct	message,	and	do	almost	everything	you	can	do	on	the	web	right	from	your	phone! Just	go	to	your	app	store	on	your	phone	and	search	for	Livingtree. If	you	have	any	questions	about	Livingtree	or	about	your	account, please, do not hesitate	to	email	support@livingtree.com for	assistance. We	hope	you	enjoy	using	Livingtree!